Fossil fuels may be an inexpensive solution for power generation but they pollute the environment and they cannot last forever; that is why we are turning to alternative renewable energy sources to cover for our energy needs at all levels, residential, commercial or utility scale power applications.Green power for homes is a new concept that individuals and families are starting to adopt when considering the broader idea of making a home. Construction industry and other related professionals, such as renewable energy technology manufacturers, installers, contractors, engineers and architects are promoting this concept by helping people understand the importance of using alternative energy sources and acknowledging the technological means to achieve this. There are mane benefits in going green – environmental and economical. Environmental benefits protrude from using environmentally ‘friendlier’ means to generate power, or reduce our energy needs and consumption or reduce our harm to the environment. Green power for homes helps reduce our consumption of fossil fuels, such as oil and natural gas, and consequently reduce CO2 and other harmful gas emissions into the atmosphere that contributes to pollution and global warming. Economical benefits can be realised in the long run as reductions in our energy bill; this can be achieved either through reduction in our energy needs (e.g. energy saving practices, green building applications etc.) or by using (or selling to the grid) subsidised renewable energy in place of utility electrical power. Combining environmental and economical justification in using green technologies and switching to green power solutions for home applications can in fact lead to a sustainable energy solution for our planet. Solar photovoltaic (PV) panels capture solar energy using PV cells to generate electricity. The cells, through photoelectric effect, when exposed to sunlight generate electricity that can be used either to be fed on to the utility power grid or to power household electrical appliances and lighting. Solar panels can be very beneficial especially in places of abundant sunlight; solar radiation comes for free and once PV panels are installed, the PV system can start generating electricity from sunlight. Electricity that is generated from solar panels is green, renewable electricity that can be subsidised through feed-in-tariffs or through tax incentives. 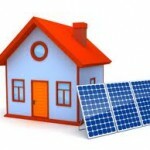 Consequently Solar panels for home can provide a source of additional income or cover for home electricity needs. As in every renewable energy technologies, solar electricity is green that does not emit any CO2 or other harmful gasses into the atmosphere; thus help reduce environmental impact. In general a typical residential solar system installation may help save around 1 tonne of CO2 per year. What is important to note is that solar PV systems have seen a tremendous cost reduction especially in the past 2 years bring the total PV panels installation cost to around $1,850 per kw installed (cost for a complete system) and it is capable of producing around 1500-1800 khw per year (given good panel positioning and proper climatic conditions – e.g. in California). 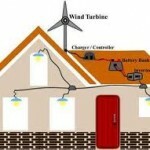 Wind turbines harness wind power to generate electricity. When the wind blows, wind turbines use rotary blades to catch it and rotate by converting wind speed (force) to rotary movement. The rotary movement turns a generator that generates electricity. In general there are two types of wind turbines that are generally used for residential applications– pole mounted, free standing ranging around 5 to 6 kw, and building mounted, smaller wind turbines of about 1 to 2 kw usually mounted on buildings’ roof tops. The benefits of using wind turbines for home include reducing your electricity bill, creating additional income from feed-in-tariffs and reducing your carbon footprint by using renewable green energy in place of conventionally generated energy. A residential wind turbine system may cost around $ 2,700-3,000 per kw for roof-mounted systems or approximately $5,000-5,300 per kw for pole mounted systems that produce more electricity than roof-mounted systems. You may expect a well sited 5kw pole-turbine system to generate approximately 8,000 – 8,400 kwh per year – equivalent to approximately 4.5 tonnes of CO2. Next post: Green buildings: bioclimatic design, passive energy systems and renewable technologies.